It is understood that the first fleets of Incursus were observed during the colonization of the solar system, Cat, in the Essence system. The foundation of the Gallente Federation caused an explosion of civilization across this sector of space. It was when several migrating fleets of Incursus devastated long caravans of barges that these frigates gained notice. It was not long until orphaned spaceships were domesticated and swiftly worked their way to the front of the Gallente Navy. 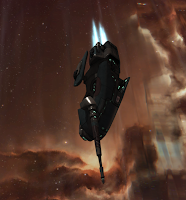 It has been noted that Incursus are fleet spaceships. Their large migratory trips span the entire width of the Gallente Federation. The migration appears to be constant if long term. These frigates have proven to be a hardy species, prone to low fatigue over long trips. The highly social nature of the Incrusus makes it an excellent front line ship. In domestication, Incruses are used as both scouts and initial assault spaceships. Their tough, exterior armor is duel layered and self repairs at a rapid speed when provided the proper nanite diet. Due to its highly developed social skills, the Incursus has proven swift and reliable to train. Incursus are highly sought after by new capsuleers. Many will eventually acquire their own, personal herd. The loyalty of these frigates is astonishing. Many capsuleers can release their frigates to migrate with the wild fleets only to have them respond to trained sequences years later. This fierce loyalty makes the Incursus a frigate that will never be bypassed by an active, efficient Navy. The Incursus is equipped with a large spear on one side of the spaceship. This spear is seen on each ship and does not appear to differentiate in size by gender or fleet position. Normally, sharp protrusions are seen on spaceship hybridism types bred by Sansha's Nation. The Incursus appears to have come about its spear as part of its natural, evolutionary path. Notation made of migratory fleets have shown Incursus jousting with these spears. As the ships work their way up the fleet rankings the jousts become duels and at the level of Wing Commander they often end in death. All spaceships are seen jousting and appears to prove an important role in venting the natural aggression of these spaceships. Incursus are also known to cohabit with symbiotic drone pairs. The Incursus spear like, rigid limb is know as the stimulare pungere virga.